"Towards the Understanding of the Workings of Nitrogenase from DFT calculations"
"The interface between silicon and a high-k oxide"
Computer simulations provide us with a view at the smallest structures of matter that lies beyond the capabilities of experiments. 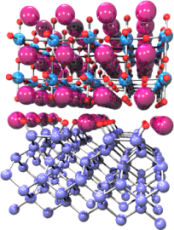 We investigate a material starting from atomic nuclei and electrons as basic building blocks. On atomic dimensions we need Quantum Theory to describe the behavior of electrons, which form the glue that ties the atoms together into extended molecules and solid materials. The electronic structure is the root of many materials properties, such as color, weight, strength, chemical reactivity, electrical and magnetic properties. Such simulations are hoped to contribute in the future to the molecular engineering of more efficient materials and catalysts, thus moving part of their development from the laboratory to the computer. The quantum mechanical description rests on the Density Functional Theory, for which Walter Kohn was awarded the Nobel prize in Chemistry in 1998. The ab-initio molecular dynamics approach developed by Roberto Car and Michele Parrinello provides movies of the atomic motion at finite temperatures or during a chemical reaction. In the department we use the CP-PAW program-package developed by P.E. Blöchl and his colaborators, which is maintained and distributed by the department. The Projector augmented-wave (PAW) method invented by Peter Blöchl is an accurate and efficient all-electron electronic structure method for large systems and dynamical studies. Its strengths lie in its capability to treat complex systems and to determine atomic structure and dynamical trajectories of the atoms. Currently our main interest are oxides, their defects, interfaces and surfaces, and reactive processes in biological enzymes and of catalysts. Oxides are protective layers for metals. They are the material of optical fibers in communication technology and they are are crucial for semiconductor industry, as protective and insulating layers. About one-third of all enzymes, the motors of biological cell processes, contain transition metal complexes as active component. The investigation of their function is allows us to understand the underlying workings of nature. Furthermore, we hope to learn from nature new chemical processes for use in industry. The development of new algorithms for the simulation of materials properties is a second line of research pursued in our research group. The department is the distribution site of the CP-PAW code, the original package for ab-initio simulations using the PAW method. In order to meet new challenges in theoretical materials research, there is a continuing effort to enhancing the capabilities of our methodology and to explore new avenues for the description of materials, including multiscale approaches and correlated systems.